Last night, my son Abel and I went up to Snoqualmie Summit Central for a few hours of night skiing. 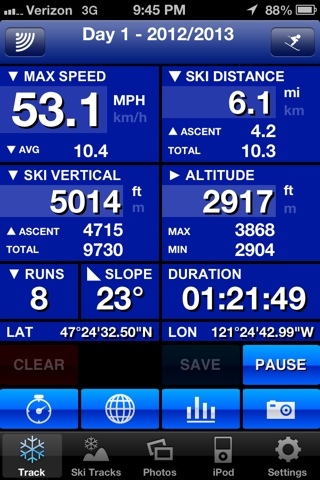 I had downloaded a new ski app on my phone called ski tracks, which, among other things, records your top speed. At first, I forgot to turn it on. Then, on my next run, I hit 45 mph (on triple 60 face, for those who care). We did the same run again, and I hit 48. Then, on the next run, we went across the triple 60 cat track. I jumped off about 50 feet before the end and just aimed the skis straight, ignoring the ruts and the moguls. When I got to the bottom, still standing, I checked my speed. Not bad for an old dude skiing at night in the springtime.